Aboard the taxi from Tsukinowa, a train station more than an hour away from Tokyo, the Higashi Matsuyama landscape stretched towards the Tokigawa River. It was a sunny Sunday morning and clear blue skies shined over glimmering factories continuing one after another on the way to Maruki Gallery for the Hiroshima Panels. The Hiroshima Panels (1950–1982) are a set of 15 permanently displayed paintings by the artist couple Iri and Toshi Maruki that depict the horrors of the Hiroshima and Nagasaki atomic bombings. Many have probably seen the famous and controversial folding panels only in books, and these works alone are worth a visit. 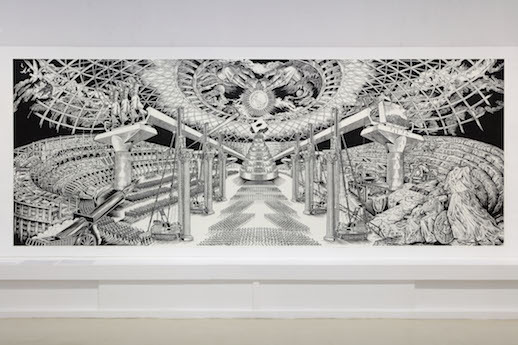 However, currently the gallery is also showing Dyslympia 2680, a temporary exhibition of large-scale woodblock prints by Sachiko Kazama. 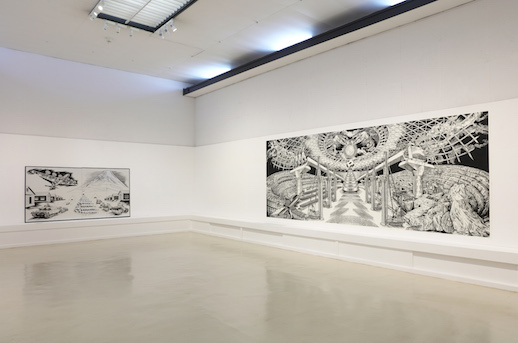 Kazama is known for her research-based artistic approach in woodblock printmaking, which she describes as a “process of excavating the truth from concealment and oblivion.” For this exhibition of old and new works, she researched Japan’s industrial past, particularly its history of military utopia narratives. She then juxtaposed facts forgotten in the problematic present to come up with visions of the future in her prints. The centerpiece of the exhibition is Dyslympia 2680 (2018). Measuring more than six meters in length and two meters in height, this work lyrically depicts Kazama’s vision of the country’s present reconstruction and its plans for after the 2020 Tokyo Olympics. However, unlike any typical linear approach in storytelling, the immense woodblock print portrays different plots within the same story. The rightside panel shows a subplot about the destructive result of progress, whereas the left illustrates reconstruction as heroic and necessary. When seen from a distance, the distinct plots collapse into the mechanical chaos of Kazama’s imagery, revealing a dystopian cosmos where school children form a squadron of factory workers and soldiers are ready to offer their lives for some higher purpose imposed upon them. Another engaging piece is an equestrian portrait of a heroic character in full metal armory titled Duel! (2017). The protagonist is pointing a gun towards an imaginary enemy while the scenery behind him illustrates the Battle of Iwo Jima. The print references a scene in Miguel de Cervantes’s Don Quixote in which the protagonist is fighting a fictitious enemy. Kazama has made the panel a melange of fantasy and reality that refers to the 1932 Los Angeles Summer Olympics, when Japanese Imperial Army officer Colonel Baron Takeichi Nishi won the gold medal in the equestrian match. Nishi died ten years later in WW2 defending Japan’s Iwo Jima. Woodblock printmaking has a long history in Japan. In the Meiji era (1868–1912), it produced manga consumed mainly by public audiences and thus became one of the earliest mass media vehicles of propaganda. It proved an effective tool in communicating to the public and was used to popularize the life of the Meiji emperor and the military campaigns of the Japanese Imperial Army. Essentially, woodblock printing created popular norms that legitimized power; at the same time, its effectiveness as a tool of propaganda also allowed social movements to harness its potency to counter the dominant powers. Kazama’s work carries on with the powerful aesthetics of socially conscious woodblock printing. More than this, however, her aesthetics are an example of what German filmmaker Werner Herzog calls “ecstatic truth.” This core principle of his approach to cinéma vérité is defined as a poetic way of describing the elusive and mysterious realities in life by fabricating and stylizing truth. In this sense, truth illuminates rather than creates norms. Applying this concept to Sachiko Kazama’s research-based approach, we can see how her prints function as truthful illuminations of Japanese realities once concealed and consigned to oblivion.